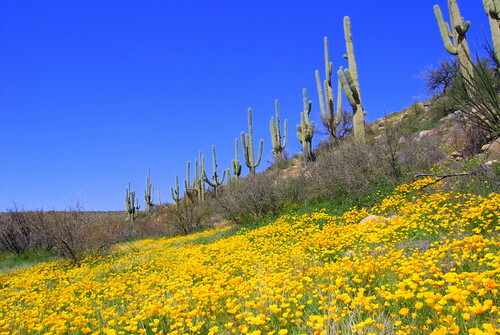 March is the month for wildflowers in the Sonoran Desert. ...At least that's how it usually works out. Predicting exactly when the big bloom will occur is almost impossible since it depends on a number of different factors, such as the rains from the previous Winter and Summer, the temperature and how quickly it rises, and even the amount of wind sweeping across the desert floor. 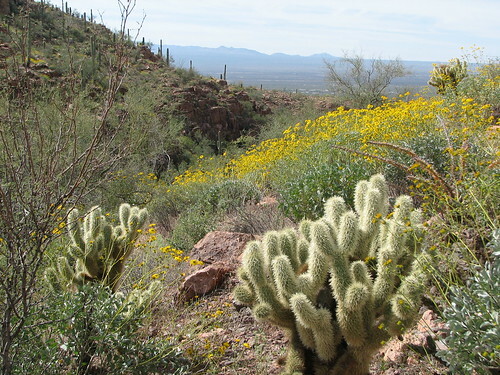 The Arizona-Sonora Desert Museum has a great page that details the difficulty of predicting a wildflower bloom. When the colors do start appearing, you had better hit the trail quickly, because the peak season typically only lasts for about two weeks. It can begin as early as mid-February and go as late as April, but March tends to be the best time to catch the bloom. You can use resources like DesertUSA's Wildflower Reports page to see up to date reports from other hikers showing where and when flowers are blooming to help you time your trek through the colorful desert. Although the Tucson mountains are generally quite rocky, the Hugh Norris trail up to Wasson Peak has lots of soft dirt and not a ton of other plants, which makes for decent wildflower conditions. Plus, from both the ridge walks along the way, and the summit itself, which is the highest in the range, you'll have great views of the desert below, which can look surprisingly yellow. More well known for the famous cascades at the end of the hike in, Seven Falls is also a great hike for scoping wildflowers as they invade Bear Canyon in the Spring. 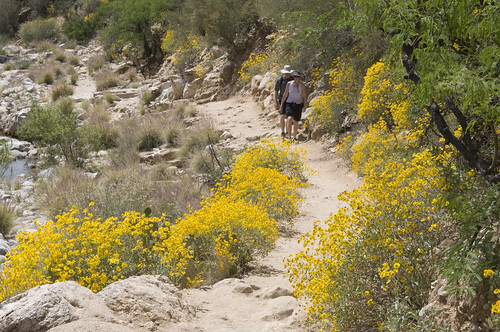 You won't get the sweeping desert views of the emerging colors that can be found elsewhere, but you'll get to walk right through corridors of flowers that sprout up along the trail as it zigzags up the riparian area. Don't let the name fool you. This loop hike out West of town can explode with color (mostly yellow poppies and brittlebush) during the Spring wildflower bloom. 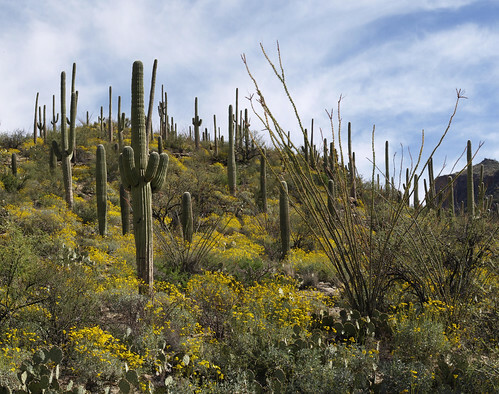 Since it's right next to the Arizona-Sonora Desert Museum, you can easily tack on a visit there before or after the hike to learn all about the environment that you'll experience on the hike. 8. Esperero Trail to "Cardiac Hill"
Like Seven Falls, this hike starts at the Sabino Canyon Recreation Area in the front range of the Santa Catalina mountains. 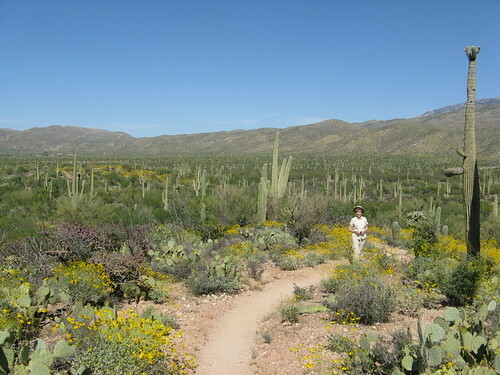 Although that area of the Catalinas tends to be rather rocky and not well known for its flower displays, there are several places along the Esperero Trail up to "Cardiac Hill" where the conditions are ideal and you can see the Sonoran Desert dressed in green and yellow. If you're not up for doing the entire level 5 hike to Wasson Peak, our #11 pick on the list, you can still see some great color in that area by doing the Gould Mine Loop. Starting out by the Arizona-Sonora Desert Museum to the West of town, this hike will have you going up the King Canyon Trail into Saguaro National Park West and past some old ruins such as an abandoned mine and petroglyphs etched into the rock by the native people over a thousand years ago. Also, it's a great place to see the wildflower bloom if you can time it right. Good soil, water, and not too much vegetation are among the conditions needed for a good wildflower display. 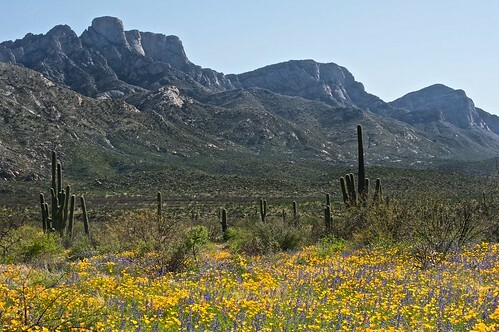 Catalina State Park to the North of Tucson has all three, which makes it one of the best places around to witness the Spring bloom. 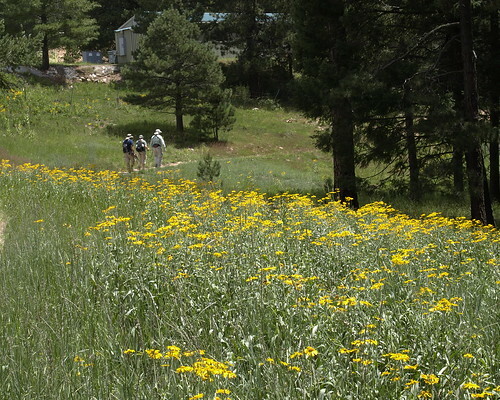 The first CSP hike on our list is also one of the most popular. The hike to Romero Pools is beautiful any time of year, but it's especially stunning in the Spring when the surrounding desert is adorned with purple, yellow, green, and white. 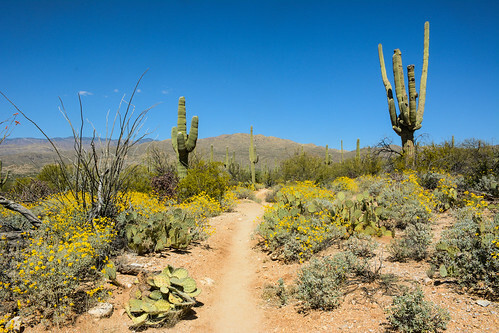 Like Catalina State Park, Saguaro National Park out East has some of the better conditions around town for wildflowers. Hiking the Loma Verde Loop is a great way to experience the wildflower bloom, check out an old copper mine and enjoy a great view of the cactus forest from the top of a small hill as well. This lesser known loop up in Catalina State Park will take you up onto bluffs, down through arroyos, and across seasonal streams, all of which can be populated with beautiful purple and gold flowers. 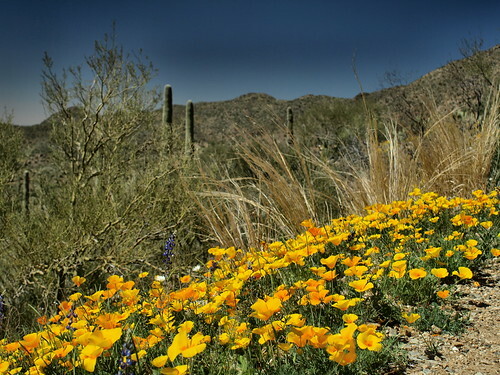 Our last hike in Saguaro National Park on this list, the out and back hike to Garwood Dam is a great place to see flowers galore among the foothills of the Rincon Mountains. When there's been a lot of Winter precipitation, not only is the bloom likely to be strong, but there's a good chance you'll find green grass, along with even more flowers, and flowing water from all of the snow melt up by the dam itself. Up in Catalina State Park, the Sutherland Trail is one of the best tracks to trek if you want to see the full range of wildflower colors. The Romero Canyon Loop hike will give you a good introduction to the area and you can always build your own hike if you want to explore further down the trail. 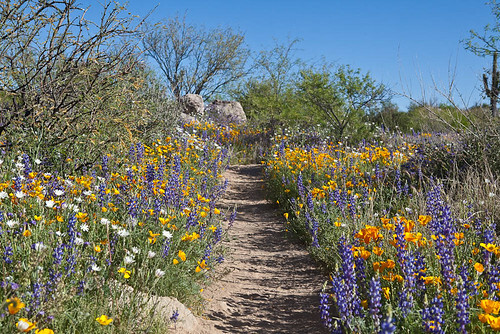 Yes, this list is mostly focused on hikes where you can experience the Sonoran Desert wildflower bloom in the Springtime, but there are many trails at higher elevations with beautiful wildflowers as well. They just tend to start their show later in the Summer, around July and August. 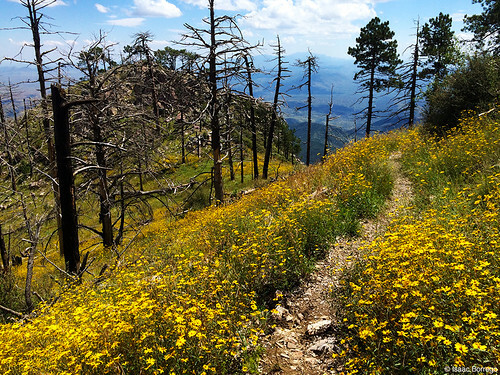 The Mount Lemmon Meadow Loop up at the very top of the Santa Catalina Mountains has several stretches where you can reliably find alpine wildflowers. If you're lucky, you might even find them covered with ladybugs. Another high altitude hike full of color is the trek up to the highest peak around, Mount Wrightson. 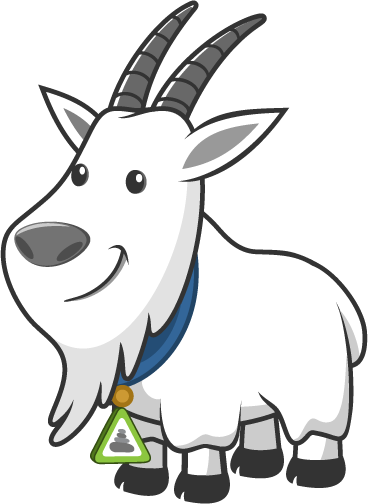 As you approach the summit, you'll enter an area that was burned in the 2005 Florida Fire. While it's tragic that the forest suffered significant damage, the silver lining is that it cleared the mountainside for seas of wildflowers to pop up. If you can time it right, the best place to take in the Spring wildflowers around Tucson is actually just a bit up the road. Picacho Peak State Park, which is a short drive up I-10 from town, and impossible to miss from the highway, consistently has some of the best blooming beauty anywhere in Southern Arizona. 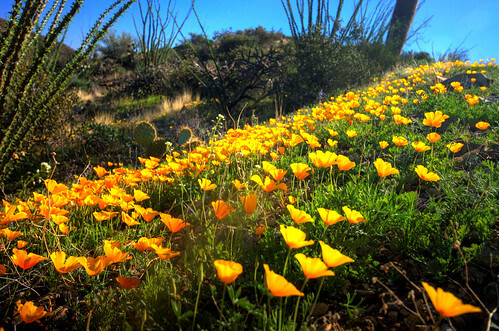 Whether you take the Hunter trail to the summit and look down at the colorfully carpeted desert, or you stroll among them on the Sunset Trail, Picacho is the place to hike for wildflowers. Do you agree with our list? Did we miss anything? 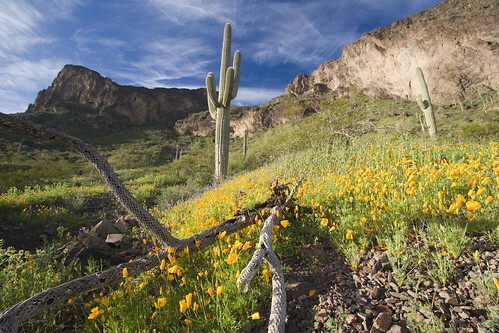 What hikes have you seen the best wildflower displays on around Tucson? Tell us your thoughts in the comments below.